Last year I made my first ever Pavlova Wreath, it was delicious and I loved it. It was a bit of work, but it turned out fantastic. This year while browsing for new ideas for Christmas, I came across this recipe, and I instantly knew I had to try it. This one is for all of you out there that don't really like to cook. 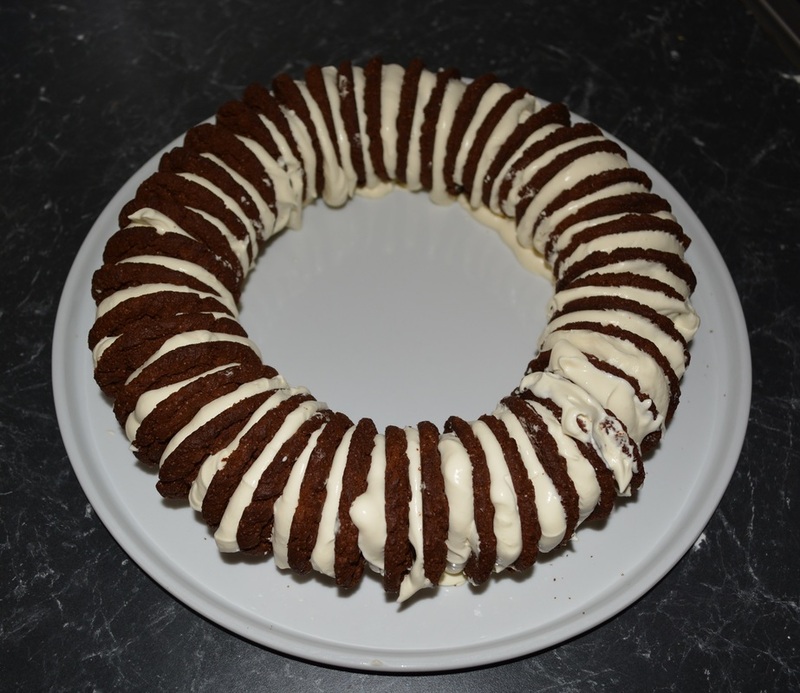 This is one of the easiest things I have ever made, you just whip some cream, and use it to join a few biscuits into a wreath shape and then decorate. Really easy. Now I used vanilla and sugar to flavour my cream, but feel free to add a small amount of coffee flavoured liqueur or cooled espresso coffee instead, but only add at most a teaspoon as you can't add too much liquid when whipping cream or it just won't whip. Also I buy one extra carton of thickened cream, just in case you need more, you will always use it for something else, I know I do. And serve this with loads of extra fruit, as it is quite creamy and I love the combination of this cake with fruit. Finally if anyone has any really easy Christmas recipes they'd like to share with me, let me know in the comments below, I love trying new things, especially if they are easy. Place the cream in a large bowl, add the vanilla and sugar. Beat with an electric mixer until the cream has firm peaks. Be careful not to take the cream too far, or you will have butter. I made this straight onto a serving plate. So using a bit of the cream, spread small dollops of the cream onto the plate in a circle shape, it will be the base for your wreath and this helps the biscuits stay in place when you start assembling the wreath. Now spread approximately 2 teaspoons of cream on a biscuit then sandwich with another biscuit, place the biscuits on their side on your cream ring as pictured below. Repeat this process until you have formed your circle/wreath. The very last biscuit, you will need to put cream on both sides. Spread the completed wreath with just enough of the cream to just cover it. Place in the refrigerator to chill for at least 6 hours or overnight. 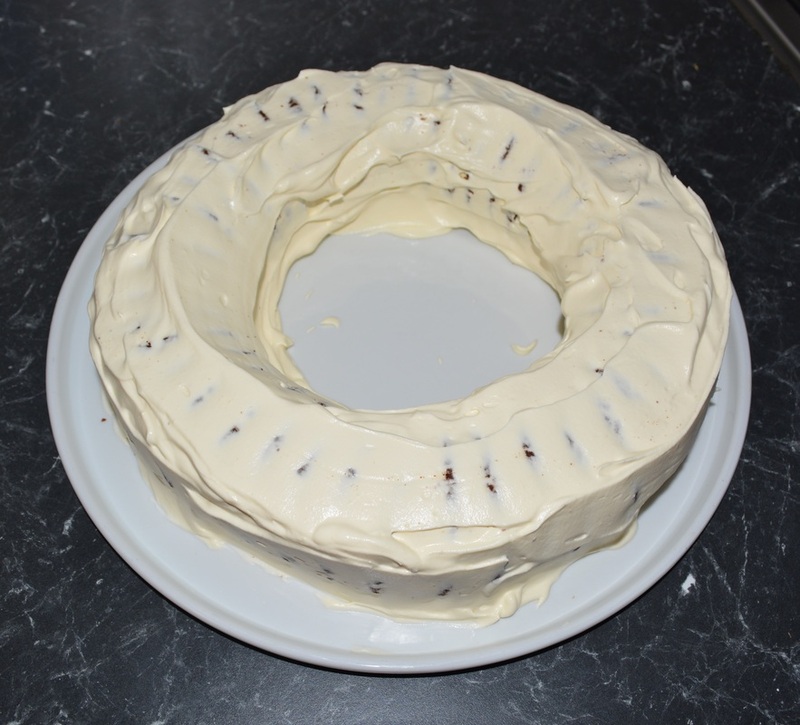 Cover the remaining cream and place in the refrigerator, it will be used to finish off the wreath just before serving. 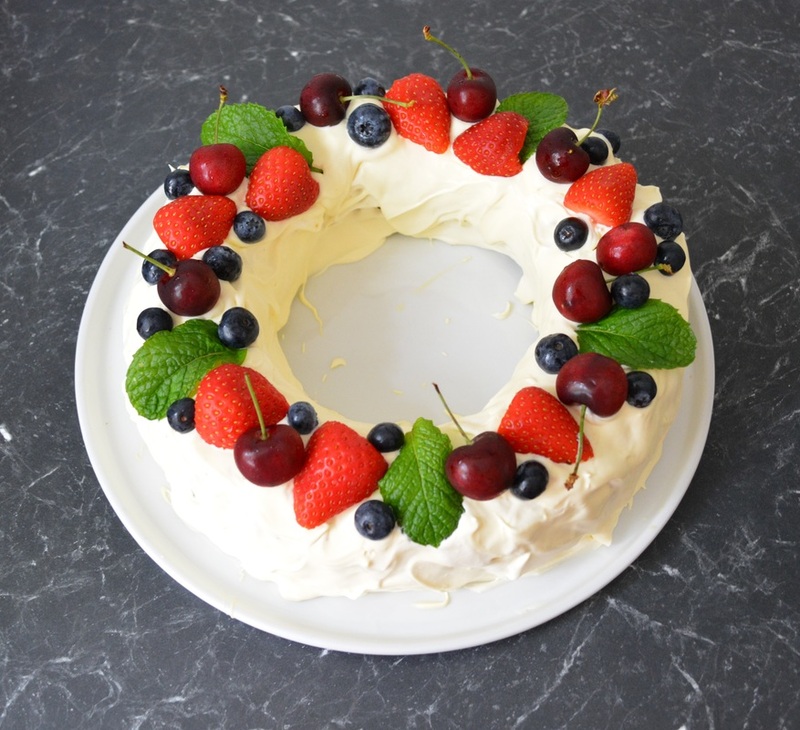 Just before serving, spread the remaining cream carefully over the wreath and top with your cherries and berries, I add mint leaves as they add a lovely colour. Serve with extra cherries and berries.